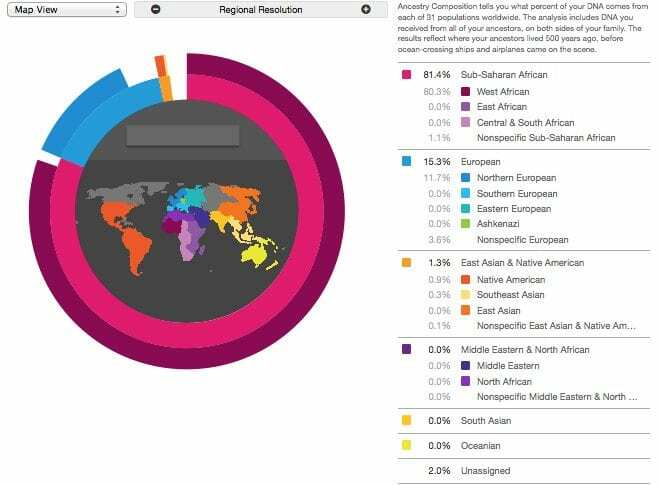 23andMe’s popular Ancestry Composition just got a little better. The feature estimates what percentage of your DNA comes from populations around the world, breaking down the Asian, African or European ancestry to give you insight into the geographic origins of your ancestors going back many generations. An example of an African American’s customer’s Ancestry Composition. Customers should start seeing the update to their Ancestry Composition over the next several weeks. It will offer people with African or Asian ancestry greater detail than they had before. We added several additional reference populations – for a total of 31. That in turn might be broken down between percentages of west, African, central and south African. The update allows 23andMe to offer individuals with African ancestry more detail into whether their ancestors came from eastern Africa, western Africa, southern Africa or central Africa. 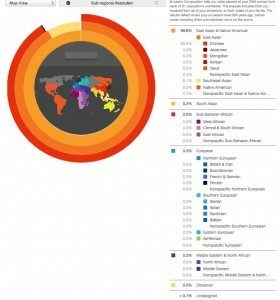 This is similar to how 23andMe reports out data for people of European ancestry, but 23andMe is not yet able to break down African ancestry by country or tribe. We are currently working on an African Ancestry Project, which we hope will ultimately improve results for people with African ancestry. An example of an Asian American’s ancestry results. Customers with Asian ancestry will get much more detail into their ancestry, breaking ancestry between eastern Asia, southeastern Asia and south Asia. In addition the update will now provide much more detail for customers with East Asian ancestry by breaking down that ancestry among five countries – China, Japan, Korea, Mongolia and eastern Russia (people with Yakut ancestry). 23andMe is conservative in making ancestry assignments, so in many cases we may list a certain percentage of a customer’s results as “non-specific” to a particular region. A customer’s results may include a certain percent of “Non-Specific Northern European” ancestry, for example. That simply means that while 23andMe has identified the broader region of their ancestry, we do not have enough information to be able to predict the country of origin for that ancestry. We do offer customers the opportunity to select a more “speculative estimate,” which can sometimes give them more detail.